Summer is fast approaching, and that means one thing – wedding season! If you know somebody who is getting married this summer, why not give them a special and thoughtful gift? Happy Wedding Day is a beautiful trailing Fuchsia which produces large flowers with pale pink sepals and a white double corolla. Plant 5 plug plants in a 30cm or 12″ hanging basket for an amazing display that will last all summer, and will be the perfect present for the happy couple. Hang the basket above head height to appreciate the stunning flowers from underneath. For more information on how to grow plug plants, have a read through our guide. Fuchsias grow well in sun or partial shade. Water them regularly to prevent them from drying out, and feed them once a week when they are in flower with a good quality multi-purpose feed. Remove faded flowers before they go to seed to encourage new flower growth. 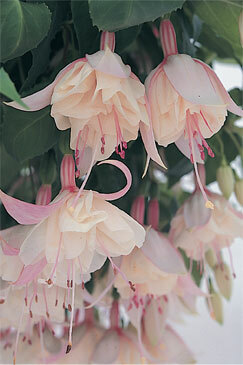 For further information on Fuchsias, have a look at our guide.